Angela Wang performs her short program at the 2015 U.S. National Figure Skating Championships. USA’s Angela Wang, who has won three medals on the Junior Grand Prix circuit, had a good start in her senior international debut this past season. The 19-year-old medaled at both of her ISU Challenger Series events, and then competed in her first Grand Prix event at Rostelecom Cup where she finished ninth. Training had been going extremely well for the 2014 Skate Canada Autumn Classic silver medalist, however, a week before she left for the 2015 Prudential U.S. Figure Skating Championships, she herniated a disc in her back. It was unfortunate timing and the skater was in excruciating pain for several days leading up to the event where she finished in 15th place overall. “I really wish I could say the injury didn’t have an impact on my performances, but it certainly did,” said Wang, who trains in Colorado Springs, Colo., under Christy Krall and Damon Allen. After nationals, the skater took three weeks off to recover, and when she was able to move better, began therapy. While the herniated disc is not “fixed” per se, the injury has since improved immensely through lots of physical therapy and bodywork. Since last season, the 2014 Lombardia Trophy bronze medalist has been listening more to her body and is focusing on staying healthy. This season, the 2009 U.S. novice bronze medalist will be including a “Rippon” loop in both of her programs. This season, Wang is keeping her short program from last year—”Paint it Black” by Angèle Dubeau & La Pietà—which was choreographed by Rachael Flatt. The skater will be using the triple loop for her solo jump and a triple toe-triple toe for the combination. Mark Pillay choreographed her new long which is set to “En Aranjuez con tu amor” by Sarah Brightman. Wang has already competed in several summer competitions in Vail, Colo., Sun Valley, Idaho, and Pittsburgh, Penn. 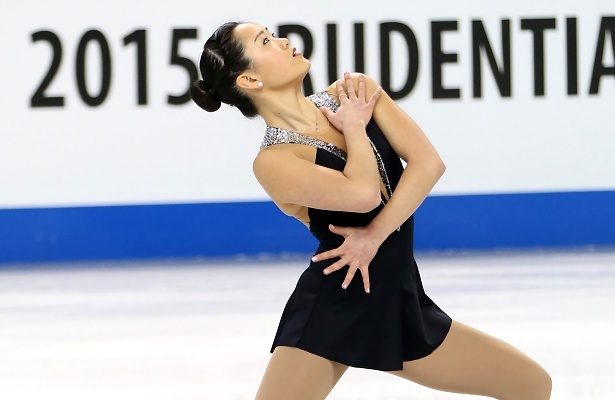 She will be competing in two weeks at the 2015 U.S. International Figure Skating Classic, and will also competed at Trophée Éric Bompard for her Grand Prix event later this fall. When not training, Wang is takes college courses at University of Colorado Colorado Springs and also works the front desk at a Pilates studio. In her spare time, the skater enjoys a good hike or walk outside. “I also like to annoy my dog, Rolo (a Yorkie-Schnauzer mix), by holding him and blowing into his face to see how long it takes for him to escape my clutches,” she added with a mischievous laugh.